There has been a lot of coverage in the media in recent months about the global impact of the livestock industry. 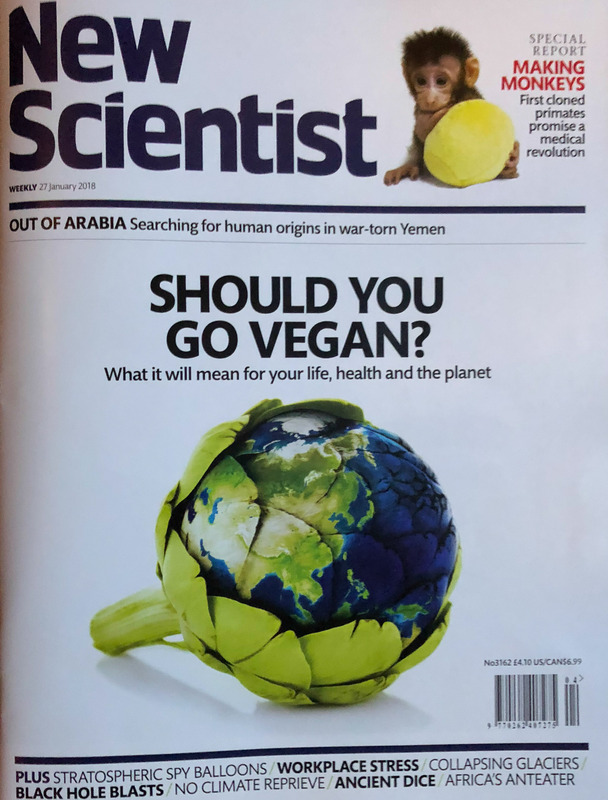 For example, New Scientist (27th January 2018) led with ‘Living on the veg – is veganism just a fad or should we all give up meat and dairy?’ The article states that 25% of the ice-free land on the planet is devoted to livestock grazing and on top of that 33% of all cropped land is used to produce food for livestock. It goes on to ask whether instead of producing animal food we should in fact be using that land to produce human food. The UK Government in 2011 produced a foresight report called The Future of Food and Farming which suggested that by 2050 we needed to produce 50% more food than we do now in order to feed the growing global population and their increasing preference for a meat diet. But Colin Tudge (the environmental journalist) and Ruth Tudge from the Campaign for Real Farming, quoting Professor Hans Herren, Director of the Millennium Institute in Washington DC, state that globally we already produce enough food for 14 billion people i.e. twice the number of people on the planet, see here. 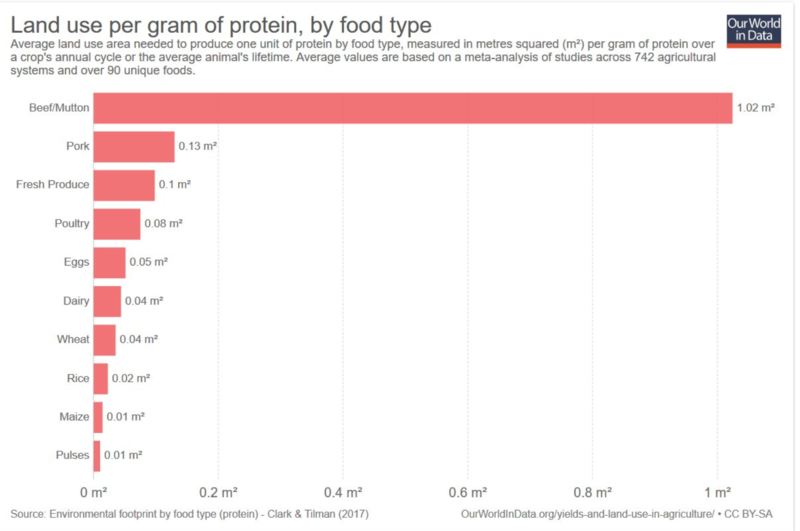 Producing protein via livestock production is inefficient when compared to plant production. As the graphic shows over 1 m2 of land is required to produce one gram of beef. By comparison wheat required 0.04 m2 and pulses need only 0.01 m2 – a 100 fold difference between beef and pulses. George Monbiot suggests that sheep in the UK provide 1% of our diet but occupy around 4m hectares of the uplands. Monbiot has also stated that as a result of the large number of sheep in our uplands they have been effectively ‘sheepwrecked’ (see here, here and here). A paper in Science of the Total Environment suggests that if we want to reduce biodiversity losses globally the answer is to reduce meat consumption as the eating of meat is increasing dramatically and as a result more ‘wild’ land is required for domestic stock.. The New Scientist article also reviews the impact of livestock farming with regard to climate change. 14.5% of global greenhouse gases are emitted by human livestock – an equivalent amount to that produced by all trains, cars, ships and planes. The discussion around meat consumption is now to be found in the agricultural mainstream as well as the environmental arena. In January this year the topic was debated at the Oxford Farming Conference, the UK’s leading agri-business forum. The motion put forward was ‘This House Believes Eating Meat Will Be A Thing of the Past By 2100’ – you can read about it here and here and watch the debate here. Prior to the debate commencing only 20 of the audience of farmers supported this motion, but after the debate led by George Monbiot and Philip Lymbery (Compassion in World Farming) against hill-farmer Gareth Wyn Jones and farmer and researcher Emily Norton, 100 additional farmers ended up supporting the motion. The motion did fail with 276 nos and 120 ayes but it was an unexpected result considering the audience. There is a growing and convincing body of evidence which demonstrates that intensive cattle rearing which is reliant on cereals for sustenance is damaging to the environment, detrimentally affects the climate and is ultimately unsustainable with an increasing world population where the growing ranks of the middle classes are turning to a more meat rich diet. Running in parallel is the trend of veganism, in 2014, 1% of the US population were vegans, by 2017 this has risen to 5%. Likewise in the UK the number of vegans has risen threefold in 10 years (New Scientist article). The UK there has also seen the emergence of a more radical form of veganism, albeit a small minority, who believe in direct action against farmers and abattoirs, to highlight what they believe as animal cruelty. In some instances, this has turned confrontational and unpleasant – see here. A topic discussed here by my colleague in the Centre for Rural Policy Research at Exeter University Charlotte-Anne Chivers. So, should we all give up eating meat? Well, without a doubt the consumption of grain fed beef needs to decline dramatically in my view and that would mean that we would eat less meat which would probably also be quite good for us. Or would it? Graham Harvey, the agricultural writer and script advisor for the Archers has produced a short film which argues that eating meat is actually good for us and that the increasing prevalence of cereals and sugar in our diets from the 1970s onwards is what has caused the health and obesity crisis – see here. However, as Harvey’s film shows, grain fed beef is not the only type of meat available, there is also pasture fed meat as well. This is the prevalent type of farming that we find, for example on Dartmoor. Extensive grazing is essential to conserve the archaeological features of the farm and maintain its wildlife habitats, so the care for our livestock is at the heart of our work. Cattle, sheep and ponies all graze in different ways and their activities maintain a diverse range of habitats which are important for many rare species of flowers, birds and other wildlife. Cattle graze using their rough tongues to wrap around and tear up vegetation, will eat coarse long grasses and so are particularly good at grazing our marshy areas and creating tussocky grass. Being heavier than the sheep they can push their way through scrub and get into rougher and wetter areas, opening it up and creating niches for wildlife to colonise. Sheep are nibblers, nipping grass off quite tightly and creating lawns, this can be great for fungi such as waxcaps. Much of the farm is scheduled as an Ancient Monument and without livestock grazing, features such as the medieval strip lynchets (the terraces on the hillsides) and the tin mining remains would become hidden and damaged by encroaching gorse, bracken and other scrub. ​Challacombe is accredited with the Pasture Fed Livestock Association – this means our livestock only eat grass or grass products, never food, such as cereals, that could be eaten by humans. This pasture-based system means that our animals have access to grazing all year, with hay or haylage made on the farm being fed to them in winter when it is cold and wet to supplement their diets. However, there is a counter narrative which suggests that pasture fed animals are worse for the planet as they produce more greenhouse gas emissions (see here) and of course there is George Monbiot’s counter narrative (already alluded to above) that grazing animals in the uplands – particularly sheep, destroy habitats and reduce biodiversity. As a result, the narrative goes, the uplands should be rewilded. The rewilding narrative is addressed by Naomi and Mark above and I have written about cultural landscapes before and the challenges of managing them (see here and here). As with so many issues to do with farming, food and the environment it is mighty complex and confusing, most people choosing the narratives which support their values and worldview to the exclusion of those that don’t. This entry was posted in Dartmoor Farming, Dartmoor food, Uncategorized and tagged Challacombe, Cultural landscapes, Food, Livestock, Rewilding, Vegan. Bookmark the permalink.